Life can routinely throw the unexpected in our path. Even if we take good care of ourselves, strive to be a good person, become more compassionate and so on, we cannot control what may happen that can become a great challenge for us to overcome. Of these unexpected events, nothing can challenge us or our families more than an unexpected health crisis. This show is dedicated to CJ’s listeners who are currently dealing with chronic health issues such as: lupus, fibromyalgia, cancer or other problems. 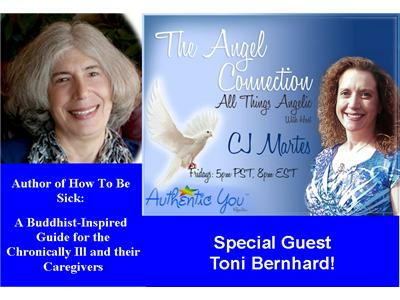 She welcomes Toni Bernhard to the show to discuss how we can compassionately guide ourselves or family members through these challenges.